Stator magnets & JB Weld - pictures? I plan to take a look at my magnets and use JB weld (slow cure/marine) to keep the magnets in place as has been discussed on this forum. I've looked through this forum and Youtube looking for pictures or video of how the JB weld should be placed on the magnets, with no luck. Does anyone have a linky to pictures or video of how to add the JB weld to the magnet area? 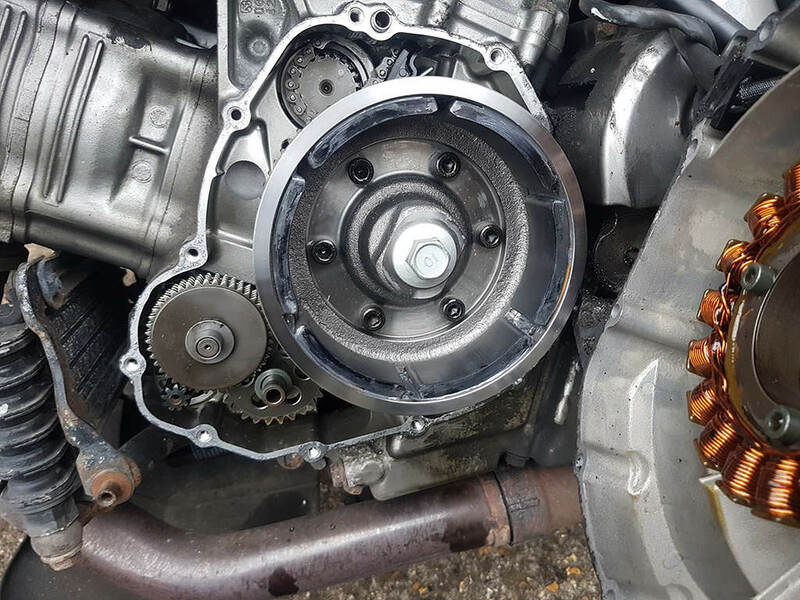 I've read about this but don't know it the stator is in an oil bath or not. If it is, you'd need to de grease the area and then even up the magnets and use a bit of the JB Weld to prohibit them from moving in the future. Apparently not a lot of JB is needed to do the job. It is an oily area. I did it 4 months ago and no problems so far. Last edited by pichulec; 02-02-2018 at 10:24 PM. That looks like a nice job of gluing the magnets into place. I don't see any JB Weld between them? That is something that I think makes this foolproof. Doesn't have to have the gap filled completely, just enough to form a bridge where there is a mechanical block keeping them from ever moving again. The standard red and black packaged JB Weld is what you want to use. Do not use the quick setting version. The standard version is rated for continuous oil immersion and constant temps up to 400 degrees. Which will more than cover what it sees in this environment. Big B, greywolf, Mulewright and 1 others like this. When I did mine I didn’t “glue” them, was afraid of contact between rotor and stator. ^^^ Thank you all for your replies - they were helpful. How did you remove the magnets without damage? I know of a couple owners that have broken magnets trying to get them out! There is no real need to remove magnets. You can simply ( and delicately ) insert a screwdriver between them until the correct separation is met. This means you are not going to "glue" under them. But, so far from what I have followed here and on the SV 1000 sites there is no benefit from putting JB Weld under the magnets. Seems to work just fine filling the gaps between them enough to form a mechanical separation barrier. Centrifugal force and magnetic attraction keep them against the rotor surface. I slide them out of rotor. I don't see any JB Weld between them? That is something that I think makes this foolproof. There is small amount between them as well, but not much. Last edited by pichulec; 02-05-2018 at 04:07 PM.